Q. What is the best way to apply a hard hat sticker? Peel off half of the liner. Use the liner-covered half to slide the sticker into position before sticking it to the hard hat. When the sticker is in the desired position, press the sticky part onto the hard hat and peel off the remaining portion of the liner. For best results, make sure the center of the sticker is the first part to make contact with the hard hat. From the center, gently work your way to the sides. Before pressing the decal firmly to the hard hat, make sure all sides are lightly stuck down. At first it will look like there are wrinkles. Smooth out the wrinkles, making sure to work around the decal evenly, so it does not bunch on one side. As always, follow manufacturer guidelines regarding the use of hard hat stickers; if you have a question, contact your safety professional. Q. Why use a reflective label? Reflective labels make it easy to spot someone in the dark using a flashlight. While they are only marginally more expensive than non-reflective hard hat labels, they could make all the difference in an emergency situation. We also offer photoluminescent labels, which glow in the dark. Q. When are reflective strips necessary? Our ShineStrips™ retro-reflective hard hat strips and trapezoids are durable and help you be seen. Our reflective strips are NFPA-compliant for fire helmet use where indicated. Q. Our company logo is pretty rough. Can it still be used for a custom hard hat decal design? Yes. We have a team of artists who can clean up and edit logo after no additional cost. Upload your logo using our wizard, or contact our customer service department for additional help with your logo design. Under most circumstances, we can have a proof for your review the next day. Q. Should I apply my hard hat sticker on the front or the side of my hard hat? It is ultimately up to you where you want to place your sticker, but award stickers are often placed on the side of the hat, while logos are more commonly placed on the front. Check with your safety coordinator or hard hat manufacturer for guidance. Q. How do you eliminate the wrinkles that often form when applying the hard hat decals? Don't go for cheap, non-conformable decals. Unlike competitors' decals, our hard hat labels are made with special adhesive, film, and liner to avoid wrinkles. The adhesive side of our decals has ridges that allow air to escape while the decal is being applied, and the flexibility of the material we use allows our decals to conform to a compound-curved surface without bunching around the edges. Most competitors hard hat stickers wrinkle. Our 3M material avoids this problem. Q. What is best shape for hard hat label? We offer hard hat labels in a variety of shapes and sizes, but the shape you choose is ultimately up to you. In general, larger labels tend to be harder to apply without wrinkles or air bubbles. Smaller circular labels and equilateral triangles with slightly curved sides are the easiest to apply to most hard hat surfaces. Q. Can I remove a hard hat label after it has been on for a year? Yes! Believe it or not, they are easy to peel off, even after a year of use.If your company reuses or updates hard hats, you don't have to worry about a sticky mess every time you replace our labels. Q. Can I create different hard hat stickers for each of our workers? 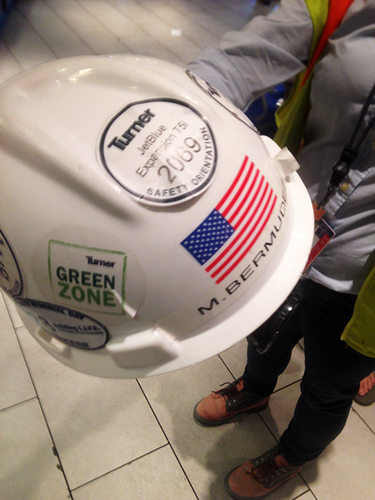 Yes, we make it easy to design personalized hard hat stickers with different names on them. You can enter multiple names into the design wizard online, or you can get in touch with our customer service department and we’ll set it up for you. For these affordable stickers, we recommend the rocker and mini-crescent labels. Q. What is a "Rocker" helmet sticker? Rocker stickers are the arched stickers that fit on the sides of a helmet. Originally favored by EMS workers and firefighters, rocker stickers are now common with construction and factory workers. These stickers are commonly used to identify supervisors, trained first aid workers or to distinguish between different sub-contractors on a job. A related sticker type is the “mini-crescent”. Mini-crescent labels fit over standard 2” outer diameter labels and contain a supplemental message. Q. We want to match one of our old sticker designs. It has a special shape that I can’t find on your site. Can you help? Yes! We do not charge extra for special shapes. We use digital die-cutting equipment that can accommodate any sticker shape. We can cut around the outside of most logos, create a star, a special 'winged' shape, and more. Contact our customer service department for details. Two general rules of thumb should be followed. First, adhesive stickers should be placed at least ¾ inch away from the edge of the helmet, to make sure they do not act as a conductor between the outside and inside of the hard hat. Second, periodically check your hard hat or helmet's shell for damage, regardless of whether or not you have stickers on it! You should try to keep the area covered by stickers to a practical minimum, so you can inspect your hard hat or helmet’s shell for damage. Individual manufacturers may have more specific guidelines; if in doubt, check with your safety professional. Q. Should we laminate our hard hat labels? Generally, we advise against lamination. Lamination adds thickness and makes the label more likely to wrinkle when you apply it. Our exceptionally durable inks and films use the same 3M printing system used by most traffic signs in the United States. The 3M inks provide a very durable and abrasion-resistant print. Q. Should I order preprinted hard hats or just a sticker? If you have a new team, need new hats or just want to show off your logo, a custom printed hard hat can make sense. But with the vast improvements in digital printing and hard hat label materials, hard hat stickers are now exceptionally durable, attractive and affordable. For a comparison of screen printed hard hats with stickers, click here. Q. What is the best color for a hard hat sticker? Contrasting colors are what we most commonly see: dark-colored stickers for light-colored hard hats, and light-colored stickers for dark-colored hard hats. Q. What is the right size for a custom hard hat decal? The "sweet spot" for a hard hat decal is usually 2" or less. At that size, the label is conspicuous, but still easy to apply. Bigger isn’t always better, because oversized decals can make it more difficult to properly inspect your hard hat for damage.